Machine Intelligence has become a broad church that has fragmented or branched off into a myriad of sectors and the number keeps expanding every year. 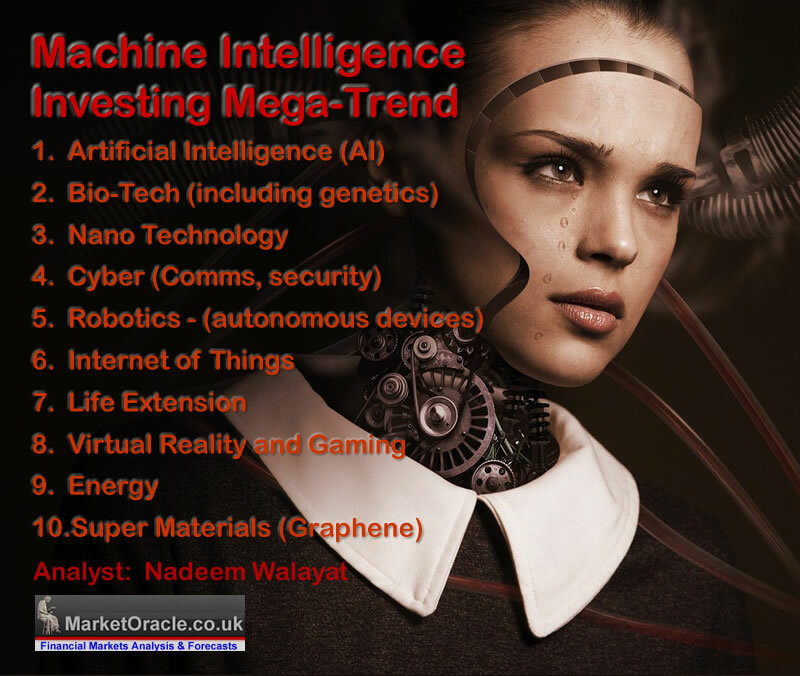 Many years ago I broke the machine intelligence mega-trend down into 9 key sectors that I have now further fragmented into 10 by basically adding Cyber Security as the following list illustrates, the 10 key machine mega-trend sectors to invest in. However the grand daddy of ALL of the 10 sectors is Artificial Intelligence, which is the PRIMARY FOCUS for investing. All of the other sectors are DERIVATIVES of AI. Which means one could ignore most if not all of the other sectors and just focus on investing in Artificial Intelligence, for most of the AI stocks by nature encompass aspects of the derivative sectors. So what do I mean by investing in Artificial Intelligence stocks. Basically this is investing in companies that are at the very forefront of developing self learning technology as the back bone of their business rather than for instance a company that is just focused on developing a self driving car, usually using AI already developed by another corporation. So when investing in Artificial Intelligence I am basically focus on 10 Tech giants that have both existing DEMAND for raw processing power of self learning algorithms and the resources to to commit to the development of artificial intelligence i.e. billions of dollars sat in the bank. So you should not be surprised if you recognise most of the stocks on my Top 10 AI investing list. First a brief primer of how to actually invest in stocks and no I don't mean the dynamics of placing orders with brokers. 1. ACCUMULATE - The objective is to accumulate positions over time so as to avoid major peaks and troughs. Timing doesn't make much difference because you don't have the benefit of hindsight when investing i.e. it does not really matter if the stock market is soaring or plunging. So set yourself a monetary target of how much of each stock your aiming to accumulate over a period of time. 2. Target Stocks List - You are going to have a list of target stocks that you are always ready to accumulate into whenever the opportunity arises. So that whenever the stock market does take a tumble, your not sat twiddling your thumbs trying to work out which stocks to buy because you already have a list of stocks PLUS a target amount to buy based on your AI investing game plan. 3. Best Stock Picking Indicator - Most analysts obsesses over stock fundamentals. However whilst significant, in my opinion the most important indicator of how the stock is doing is its performance relative to the general stock market indices, as you want to be wary of buying a stock when it is UNDER PERFORMING against the general stock market indices, which is a warning sign that something could be going wrong that may take a while to show up in corporate data. 4. Remember you are INVESTING NOT TRADING. So you are going to be committing funds for at least 5 years and likely more than 10. My strategy is basically to invest and forget. I don't do use online portfolio updaters, which can result in people wasting time checking the value of their portfolios several times a day! Instead I use manually updated spreadsheets that at best I update quarterly, and usually a less frequently. Because I am INVESTING NOT TRADING. For instance I have held some stocks such as Microsoft and Intel for DECADES! So basically don't think too much about what your invested in after you have invested. i.e. avoid regular monitoring otherwise you may end up making the mistake of bailing out that you will likely regret selling later. 5. Market Timing - I know its hard to tell you not to time your entries, especially after the market has had a good run and ones instincts are wait for a correction, but then you'll end up waiting that bit longer and the stock will start to rise again, and so you'll want to wait for it get back to where it was when you were going to buy but you didn't because you thought it would go lower, instead it goes even higher. Now you think to yourself DAMN I've missed the move, and then wait for it to fall again. All the while the stock keeps trending higher as one would expect a good stock to do! Firstly, this there is NO such thing as a missed market move! Because everything is always clear in HINDSIGHT! ACCUMULATE! Don't worry about what the price is doing at any particular point in time, it's just noise, instead ACCUMULATE! Keep your eye on the big picture. For instance I have been accumulating Google (Alphabet) virtually every year for the past 10 years! Regardless of where the price its trading i.e. every year I put money into my ISA's and Pension Fund and then INVEST that into the list of target stocks. Trying to time for a few extra percent is just a waste of time. YES, if the market takes a PLUNGE and presents one with an buying opportunity then TAKE IT, but don't try to time entries for individual stocks, because then you will likely fall foul of the "missed market move" syndrome and become stuck. 6. Dividend vs Buy back - Most will be aware that tech stocks, even tech giants such as Google and Amazon don't tend to pay dividends. Instead what investors usually get are share buy backs that result in capital appreciation rather than income. So annual dividend payments should be seen as a bonus as the primary return is capital appreciation, in significant part courtesy of share buy backs. That also tends to act as support in times of falling stock prices, i.e. companies step in to buy their own shares because they deem them to be cheap. In terms of total returns, investors tend to do best in companies that regularly buy back their stock. 7. LIMIT RISK - Investing in the stock market is high risk! So investors should aim to minimise that risk, and one such way of doing so is to NOT to invest in SMALL and Medium cap stocks, where you will basically be gambling with your money. So if you have come here for a list of small cap get rich quick stocks then you will be disappointed. My investing objective is to maximise long-term returns whilst minimising risk to capital, which is why I don't have sleepless nights worrying about how my stocks portfolio is doing following the latest flash crash because I understand that the stocks I have selected have a very high probability of delivering in the LONG-RUN. 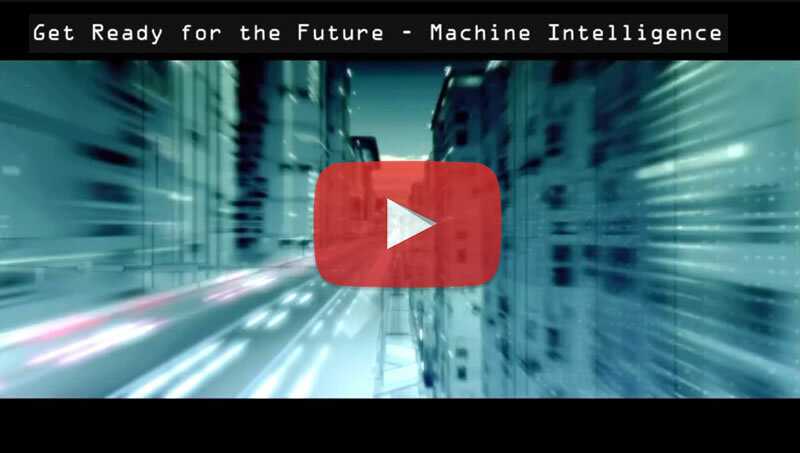 Where to invest to profit from the exponential machine intelligence mega-trend. I have ranked these stocks in in terms of risk vs reward and volatility. Do remember that when investing in the stock market that your capital is at risk. There are NO SURE BETS! The stocks are ranked in order of priority. Also to further break down the list, I consider the first 5 stocks as PRIMARY i.e. the most important. The next 3 as of SECONDARY importance and finally 2 far more risky TERTIARY stocks. Hi Nadeem, I work on cutting edge technology myself (Engineer, PhD) and I can assure you that average machine intelligence will not surpass average human intelligence by 2022! That point is decades away, if indeed it's truly *practical* this century. A chess-playing computer in a rule-based game is impressive, but with the complexity of the real world, I'm sorry.. For certain, automation in the shape of algorithms will change the world of work and lead to classical "creative destruction". Many jobs will fall by the wayside and productivity will also improve, but the dream of robots and AI running everything is a pipe dream right now. Do not believe the hype!! I'm meant when cutting edge machine intelligence will start passing average human intelligence 2022, from then on its exponential.